you can step out of your tub and dive into your swimming pool. HEAVEN! adds a lot to the bathroom. did or would you have had pebbles under the tub too? I love the bathrooms you share on your blog. This is zen, calming, and beautiful! 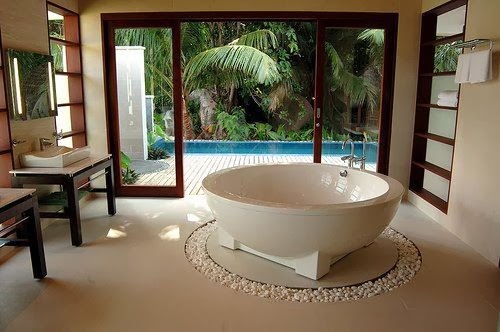 I love that the tub is placed on a pedestal. The pebbles are so cool, I've never seen such a thing in a bathroom!